Missouri is finally developing an energy plan. Woohoo! The state was basically forced into it by the new EPA regulations on carbon dioxide emissions from large stationary sources. The largest stationary emitters of greenhouse gas are coal burning power plants, and to comply with the new regulations the state has to develop an energy plan. There is a certain calculus at work here. The fundamental cause of excessive GHG emissions is us – humans. We like to use energy, and most of the energy we consume is created by burning fossil fuel. We use natural gas to heat our homes and do our cooking. That consumption, however, is widely distributed. The vast majority of buildings have their own furnaces, their own kitchens. We like to drive our cars. That consumption is also widely distributed. Electricity, on the other hand, is generated at very large power stations, and it creates lots of GHG emissions. While they are only part of total GHG emissions, it might be possible to achieve reductions by focusing on large power stations and other large industrial facilities. In Missouri, large stationary sources emit 89.8 million metric tons CO2e. In this state, fully 82% of it comes from power plants. (See second chart at right.) All other sources combined account for less than 1/4 as much. The second leading sector is minerals, the large mining industry we have in Missouri. It accounts for 12% of large source GHG emissions. 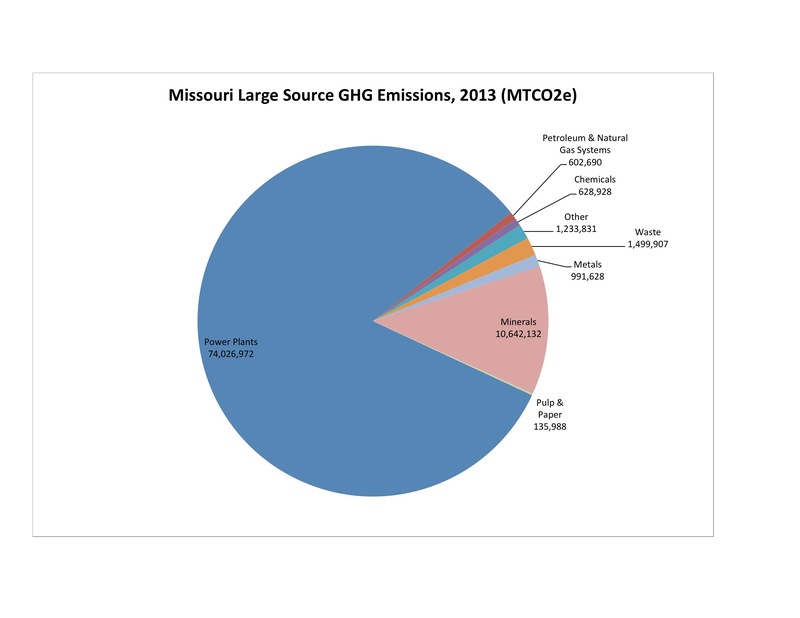 Between 2012 and 2013, emissions from large sources increased in Missouri by 1.4%. The IPCC has estimated that to prevent the worst ravages of climate change, GHG emissions must decrease greatly. We‘re still increasing. There could be several reasons for Missouri’s extreme concentration of GHG from power plants. It might be a sign that we rely on coal to generate our electricity, and have stubbornly refused to change. It could be a sign that our energy infrastructure is inefficient. Or it might be a sign of how much other industry has fled Missouri. Or it could be a combination. Table 1 shows the 10 largest single source GHG emitters in Missouri. Nine of them are power plants, 1 is a cement plant. Table 1: The 10 Largest Single Source GHG Emitters in Missouri (2013). In terms of corporate responsibility, Ameren Inc. accounts for 1/3 of all large stationary source emissions in Missouri. KCP&L is part of Great Plains Energy. Including KCP&L, Great Plains Energy is second, with 22%, and Associated Electric Cooperative is third, with 18%. Together, these 3 companies by themselves account for 73% of all Missouri large source GHG emissions. EPA. Facility Level Information on Greenhouse Gases Tool. http://ghgdata.epa.gov/ghgp/main.do. Data downloaded 10/30/2014. 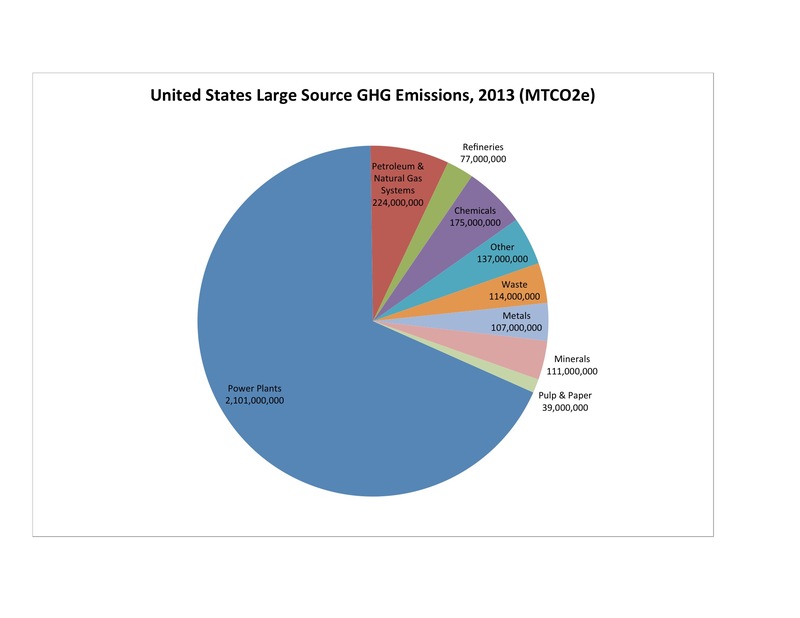 By mogreenstats in Climate Change, Greenhouse Gas Emissions on 2015/01/04 .